With the ABIM Internal Medicine Board Exam less than two months away for many of you, here’s a sample rheumatology board review question. 50-year-old man comes to the ED complaining of leg weakness accompanied with a constant back pain. He mentions that the back pain has been present for the last eight days. He reports poorly controlled hypertension and diabetes mellitus. Additionally, the patient has noticed an abrasion on his left foot over the past month. 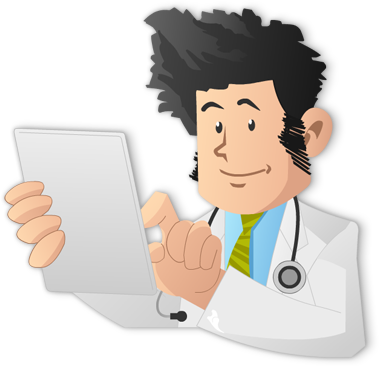 His temperature is 38.4 C (101.1 F), BP (140/90 mm Hg), HR (100/min), RR ( 20/min). On physical examination, the patient smells of urine, and his back is tender to palpation over the lumbar spinal area. Motor strength (LE= 3/5) plus decreased sensation to light touch and pinprick. He has hyperactive DTR and (+) Babinski sign B/L. What is the best next step in management in order to evaluate this patient condition? 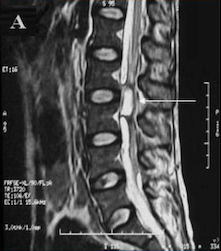 The correct answer is E. The patient’s presentation leads us to conclude that the diagnosis of spinal epidural abscess with the possibility of cord compression is the most likely cause in this case. Spinal epidural abscess is caused by hematogenous spread of bacteria from a distant source (in this patient remember the PMH of an abrasion on his left foot), or can be caused by direct inoculation (e.g, epidural anesthesia, steroid injections, etc). In addition to these probable causes, there are some risk factors that play a key role as well, for example, intravenous drug use and immunocompromised states (DM, HIV, and alcoholism). What is the most common bacteria involved in this condition? Staphylococcus aureus actually accounts for about 60% of infections caused by pyogenic bacteria. What is the classic triad of symptoms? On the other hand, if the condition is not diagnosed or treated on time and symptoms persist, patients can develop radiculopathy, motor and sensory deficits, bowel or bladder dysfunction, and unfortunately can lead to paralysis. What is the best initial evaluation in this case? What to do next after the diagnosis is confirmed on imaging? CT-guided aspiration and culture are needed in order to guide antibiotic therapy. Note: Most patients are treated with surgical decompression (within 24 hours). Why? Because we need to avoid complications which are cord compression or caudal equine syndrome. Infectious (Osteomyelitis, discitis, abscess): Look for recent infection, IV drug abuse, diabetes, fever and a point tenderness. Inflammatory (Reactive arthritis, ankylosing spondylitis, psoriatic arthritis, inflammatory bowel disease): This improve with activity or exercise, rather than with rest. Gradual onset, and HLA-B27 commonly present. Mechanical (spasm, muscle strain, and degenerative arthritis): Characterized by normal neurologic examination, possible paraspinal tenderness, and a negative straight leg raise. Spinal stenosis: Older age. Most commonly caused by vertebral degenerative disk disease. Low black pain plus leg pain is characteristic. Leg pain (pseudoclaudication or neurogenic claudication) can be confused with with that of PVD induced claudication. In both cases, leg pain worsen with extension (walking) and better with spinal flexion (sitting). However, the leg pain in neurogenic claudication is position-dependent and persist while standing still. Note: PVD induced claudication is exertion dependent and resolves with standing still. Compression fracture: Older age, trauma/fall and it is more common in women. Typically occur in the setting of decreased bone mineralization or density. Focal vertebral pain without neurologic symptoms. This can occur in osteomalacia where inadequate serum Vitamin D, calcium, or phosphorus results in demineralized osteoid. What is the most common cause of low back pain? Most commonly due to mechanical causes (examples above mentioned). This type of pain usually improves with rest, and generally worsens with exercise. Patients with symptomatic treatment usually improve over a period of 2-4 weeks. There are some worrisome signs that can indicate more serious causes (e.g, age >50, weakness, urine retention/incontinence, saddle anesthesia, history of malignancy, unintentional weigh loss, worsening pain at night, and fever or any other systemic symptoms. Lumbosacral strain is the most common cause of back pain which belong to mechanical causes. The pain starts acutely after physical exertion, and it is concentrated in the lumbar area, without radiation to the tights. On physical examination there is a local tenderness and contraction of the paraspinal muscles. The straight-leg raising test and neurological examination are typical normal. The best treatment in these patients consist of NSAIDs and early mobilization.